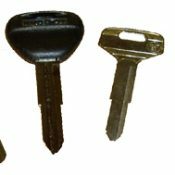 A key for Mitsubishi cars manufactured between 1972 and 1994 cut to number or photo. Models Include: L200, L300, Space Wagon, Celeste, Colt, Galant, Lambda, Lancer, Minica, Starion, Cordia, Debonair, Pajero, Sapporo, Shogun, Sigma, Eterna, Orchid, Tredia, Precis, Montero,Chariot, Eclipse, Minicab, Mirage, Nimbus, Diamante, Intercooler Turbo. We do not use original Mitsubishi blanks, we use high quality steel blanks manufactured by Silca.